All-Russian research Institute of chemical means of plant defense (VNIIKHSZR) in 1983 has developed a unique drug “Carotid”, which is both a fungicide, a bactericide and antiseptic wide spectrum of action. At the present time it is only used in Russia the product developed on the basis of original active substance and is produced entirely from domestic raw materials. “Carotid” has a unique biological properties. It is an antiseptic for all types of construction non-metallic materials – wood, stone, concrete, plaster, plasters, varnishes, paints and enamels. The action of the drug “Carotid” is not limited to short-term effect, and allows for many children to protect natural stone, brick, concrete from the devastation caused by fungal and bacterial diseases. Especially effective is the use of the drug to protect raw lumber wood and lumber from wood-destroying fungi, mold and wood-fungi. 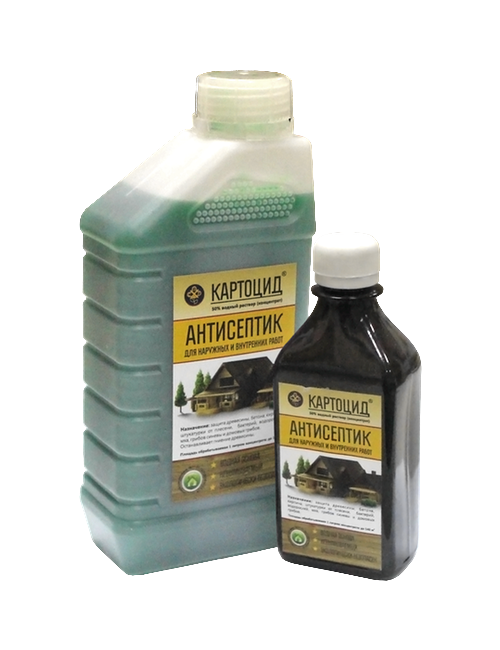 It is recommended to treat drug green wood directly in the forest, as “Carotid” has a very high threshold of absorption and permeability in wood. Because of its remarkable properties “Carotid” finds the popularity and extensive use in the construction and repair of wooden buildings: houses and outbuildings in rural areas, and it can be used in urban apartments in the repair as a substitute for copper sulfate. You should apply the “Carotid” in the processing of the basements to prevent and destroy fungal and bacterial diseases. This drug was well known in the Soviet Union, being awarded a number of industry awards, including the Bronze medal of VDNKH (1983) and the medal “Golden spike” at the International exhibition in Czechoslovakia. In the future the drug has repeatedly been patented in several foreign countries such as: UK, France, Switzerland, Japan, Bulgaria, etc. In 2014, the FGUP VNIIKHSZR was established and registered a new antiseptic drug for non-metallic materials – “Cartotid 50% aqueous solution” (Certificate of state registration NRU 77.01.34.008 E 0010 38.03.14 from 26 Mar 2014). The drug is effective, safe and beneficial to use. It is suitable for open surfaces and for residential use. Currently, the drug “Carotid” is available only in FGUP VNIIKHSZR (Beware of forgeries!). Only the original active substance provides a high antiseptic activity of the drug. Sign of counterfeit drugs, which sometimes appear on the market are primarily their low cost, lack of supporting documents and inappropriate appearance.